SOMETIMES it can be a little hard to mask your emotions. 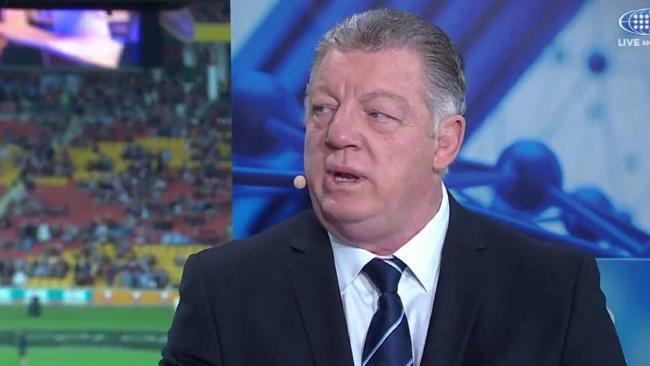 NSW legend and commentator Phil Gould can be excused for the odd statement made in his state's favour, but the former Blues coach was more fired-up than usual while commentating Wednesday's huge Origin decider at Suncorp Stadium. One incident in particular caught his eye: an "illegal" move by Queensland halfback Cooper Cronk. down the field towards Dane Gagai. Hayne was knocked to ground after Cronk's hit but was not awarded a penalty by the referee, sparking an outburst from Gould. "It is terrible the way blockers do that these days," he said. "They didn't give the chasers any chance whatsoever. That's just illegal but they let it go all the time." "There were about six obstruction calls last night that could have been called against New South Wales," Ralph said on SEN's Hungry for Sport Thursday afternoon. "It's a rort but it does happen for both sides, and if there was ever a chance that I would go for New South Wales - Phil Gould has crushed that. "His commentary is so one-sided. It is farcical. The commentary was an absolute joke."